An ORCID iD is a unique persistent identifier for researchers and scholars that stays with you throughout your career. This helps improve the discoverability of your work, connects your works, and eliminates name ambiguity. Connect your iD to your work. Use your iD in grants, publications, datasets, etc. Include your iD in your UF Directory Profile. An ORCID is important for addressing author disambiguation (different authors with the same name) and linking scholarly publications across multiple systems used by publishers, scholarly societies, funding bodies, and employing institutions. For a complete list of entities utilizing ORCID, see http://orcid.org/organizations/integrators/current. 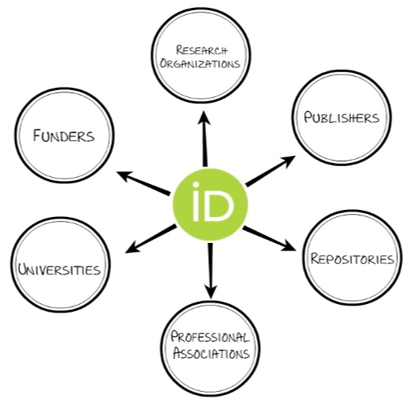 Open Researcher and Contributor ID (ORCID) is both a standard and a service to help researchers establish and maintain their scholarly identity. ORCID helps distinguish researchers with similar or identical names, differences in spellings or translations of names across languages, and changes in their name or affiliations over their career. ORCID aims to prevent name confusion in digital collections of publications or databases. ORCIDs assign unique and persistent identifiers and manages records of researchers and their research activities including scholarly works, affiliations, and funding. Recently, the George A. Smathers Libraries acquired an ORCID premium membership. An ORCID institutional membership grants UF access to ORCID application programming interfaces (APIs) and web hooks in order to develop integration with UF systems for sharing faculty publication data/outputs.